Click here to jump directly to the loan calculator. Some money to buy the car. Over time the transaction has two phases — you pay for the car with borrowed money, then you pay for the borrowed money, possibly for years. The owner of the car gets the money. The owner of the money gets service fees and interest over time. There are any number of people ready to tell you the cost of a car. In this article, my purpose is to tell you the cost of money. It's not an exaggeration to say that Americans (including governments) are drowning in a sea of debt. Apart from narcissism and an infantile unwillingness to defer gratification, an important part of the problem is that people spend too much time considering the cost of consumer goods and too little time considering the cost of money. There are creative and responsible ways to avoid the debt trap, but they require knowledge of how money works, and this article provides that knowledge. Doesn't this seem reasonable? Joe consumer wants to buy a used car, the car's price is acceptable, he can meet the monthly payments, the interest rate seems normal, where's the problem? The problem is that this loan never ends — it's an "interest-only loan". The monthly payments only cover the accrued interest, they don't reduce the owed balance at all. So Joe consumer might make payments forever. Wait — is this legal? Yes, perfectly so. Must the bank tell Joe what kind of loan it is? Yes, but in excruciatingly small print, and in language calculated to confuse and mislead, just short of felony prosecution. Can Joe avoid responsibility by claiming to be too stupid to look after his own affairs? No. If that were true, Congress would have to disband. Don't be Joe consumer — learn how consumer loans work. Learn the cost of money. If Joe pays $125 per month, the loan is paid off in 13 years 6 months and costs $20,218.40. If Joe pays $150 per month, the loan is paid off in 9 years 3 months and costs $16,561.44. If Joe pays $200 per month, the loan is paid off in 5 years 10 months and costs $13,932.14. Do you notice a pattern? As monthly payment amounts increase, the cost of the loan declines dramatically. A small increase in monthly payment produces a disproportionately large change in the total cost of the loan. This is because compound interest amplifies small differences. 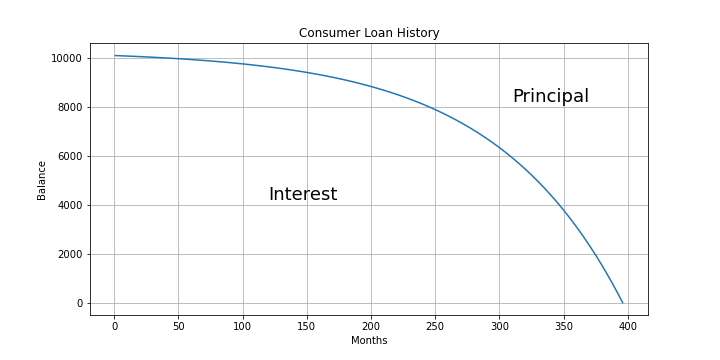 Figure 1 shows that at the beginning of a typical loan, almost all your payment is applied to interest. So if you have any flexibility in timing the payments you make, the best strategy is to make larger payments near the beginning of a loan, because that reduces the overall cost of the loan more efficiently than other strategies. Setup fees. These are fees charged by the lending institution to set up the loan, and they're added to the initial balance. In the worst case these fees can turn a marginal consumer loan into an interest-only loan (a "forever" loan). Monthly service fees. When they exist, these fees can dramatically increase the cost of a loan over time, because they're subtracted from your monthly payments — they can keep you to the left side of Figure 1 much longer than you would like. Early-payoff penalty. If this condition exists, it can prevent you from applying strategies like the above to reduce the cost and/or duration of a loan. This is just a short list of the most obvious traps. Many lending institutions do all they can to conceal the true nature of a consumer loan, so it's essential to read everything and if possible, seek counsel from a more experienced consumer before signing on the dotted line. A result of ∞ (infinity) means (a) the balance can never be paid off, or (b) there's an entry error. If you're only provided with an annual interest rate, divide it by 12 for monthly payment periods. For accurate results be sure to add any loan setup fees to the "Loan Amount" and subtract any per-period service fees from the "Payment Amount" above. To make a copy of a result, drag your pointer cursor across the results in the blue display box, then press Ctrl+C. For a more flexible calculator, more theoretical depth and an exposition of the underlying mathematics, visit my Finance Calculator page. Let me say a few words about the worst example of consumer financing — credit cards. At first glance credit cards seem pretty harmless, but I suspect more people have lost more money to credit cards than any other consumer loan scheme. And make no mistake about it — a credit card is a month-to-month consumer loan, but with all the bad parts dialed up to 11. If you fall behind in your payments, the bank will respond by increasing penalties and interest rates in a way that can only make things worse, so that your chance to catch up may simply evaporate. Young people, college students in particular, often find themselves trapped by credit card debt because of their inexperience with loans and compound interest. Older consumers may keep up with their credit card balances until a financial reversal upsets their plans and forces them into bankruptcy. And guess what happens then? Banks eagerly try to give the victim new credit cards! Why? Because once having declared bankruptcy, Joe consumer can't do it again, so he's a more reliable credit card victim. Credit cards are everywhere now, and some transactions require a card. To avoid the worst outcomes, consumers should analyze their credit card spending — see how much they actually pay for the luxury of using a card. It's often a much higher percentage than people realize. Don't have too many active cards. This is a practical issue — it's more difficult to track multiple accounts and keep them from getting out of control. Never allow an outstanding unpaid month-to-month credit card balance. Credit card accounts charge exorbitant interest rates and penalties, such that nearly any other kind of loan would be less expensive. If you can't zero out a credit card's balance each month, stop buying things. Easy to say, hard to do. Wealthy people use credit cards with impunity — they experience nothing but advantages. They don't have to carry cash around, they charge things they want, and they pay no fees. Because these people automatically zero out card balances when they come due, the short-term balance on their cards represents a free 30-day no-interest loan. How is that possible? Why would banks give wealthy people free 30-day loans? Well, they don't — the credit card system is paid for by poor people, people who have month-to-month unpaid balances, people who can't catch up. Remember this when you read your credit card statement — if you have an unpaid month-to-month balance, if you see interest charges, that means instead of buying something nice for yourself or your family, you're paying for some rich person's yacht. The remedy is simple — don't buy things you can't afford, but if you do, don't buy them with a credit card.